This customized bike, the Biontague, is a powerful combination of a folding bike and a lithium-ion powered electric motor. It was created by Electric Cyclery in Laguna Beach, California. 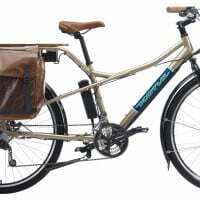 They built the Biontague by taking a Montague Swiss Bike LX folding mountain bike (we featured this bike previously here) and fitting it with a Bionx PL350 electric conversion kit. The resulting electric bike offers speeds in the 20 MPH range, great hill climbing assistance, and a range of up to 60 miles on a 3-hour charge. The Montague Swiss is a mountain bike that folds for easy transport and the whole thing weighs only 43.2 lbs (very light for a electric bike). A 36-volt lithium-ion battery pack is mounted down low on the frame. The Bionx PL350 conversion kit is reliable, lightweight and offers a range of up to 60 miles to a charge. The standard system includes a control console, a battery and a motor. The control console includes a multi-functional odometer, four assistance levels, four generative settings as well as a battery charge indicator. The price is $2425 from Electric Cyclery, plus $100 shipping in continental USA. The most powerful electric bike available is the Optibike, which costs about $5500 and doesn’t fold away. You can also buy the Bionx conversion kit separately, and install it on your own bike. I have a Montague too. ( I live in France). What are “drop outs”? What websites warn against putting e-motors on aluminum frames? Where can I get more info? Does anybody have an answer to wes’s question?